Today Was A Difficult Day | Is Blogging Even Worth It? Some days I love blogging, others, I wonder if it's worth the hassle. Set the scene. I'm sat on the floor in my childs room, surrounded by three days worth of abandoned clothes. There is unopened boxes in one corner, filled to the brim with baby bits I probably don't need and may not ever use. Empty boxes are discarded in another, not yet thrown out. Harrison is propped between my legs, sitting unaided and completely unaware that I am entirely distracted. He's happy enough playing with his singing pot, but I'm not really there. I'm distracted from him, thinking about the blog I started because of him. 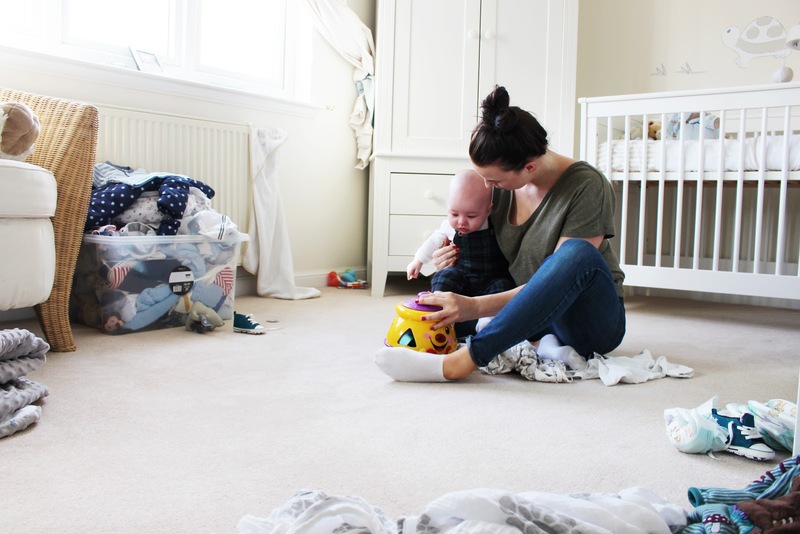 I've got four posts to write at some point that day, and I'm trying to work out how I'll manage three outfit changes on a four moth old, managed miraculously around the nap time we both desperately need. My son may be close to me today, but I am not 100% there. This is not what my blog was supposed to do, and not how my maternity leave was supposed to be spent. Today was a difficult day. 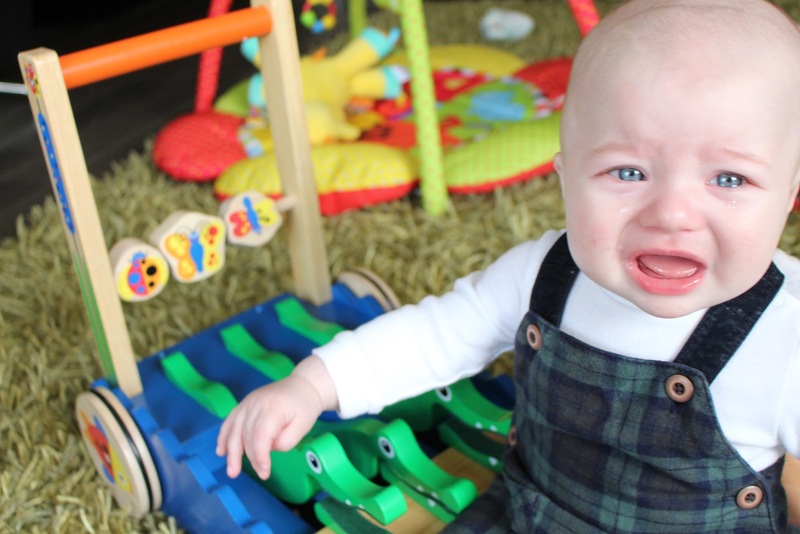 My baby was in the best of moods: for the first time in a while he was not overtired, he wasn't overcome by teething, he wasn't agitated - he was in the best of moods, and yet I was frustrated. Frustrated because I couldn't quite manage to capture him giggling whilst keeping his hands still, frustrated because nap time coincided with the perfect time for natural day-light, frustrated because I couldn't materialize the things that I wanted to, that I needed to. Today was difficult because I was frustrated, it was difficult because I made it difficult, and that is the saddest part of it all. I am not a 'blogger', I do not write for a living, and my child is not my job, but as I delve further into blogging, I've had tiny fleeting moments where I have forgotten this. Today was a bad day because I made turned it into one - I became preoccupied in the pressures of the workload I placed upon myself. There should be no reason for me to be stressing over deadlines, quality of work or feeling inferior. I blog for fun, to give myself something to look back on in years to come, a deterrent even, for when I decide I want a second child and have somehow managed to forget the sleepless nights. I used to think bloggers were over-payed. Influencers with little influence. It's easy to see that from the outside; what people see is what we portray, well put together posts, with well lit photos and smiles all around. Blogging didn't look hard because no one made it look that way: the fact that anyone could be paid for keeping an 'online diary' or sharing the products that they use daily baffled me - little did I know that running a blog is all-consuming. It's hard to write a successful one without keeping an active presence on social media, and coupling the two can lead to hours upon hours of work, which I personally never expected. If I didn't have a child, then maybe spending hours researching, or taking pictures, or editing, or writing, or doing search engine optimization might be feasible, but if I didn't have a child, my blog would never exist. I write for memories, not for money, and it's time I remind myself of that. This post is not here to help anyone other than myself. I've lost touch with reality slightly, living in the dream world of Pinterest homes and Youtube children. I've became caught up in the notion of a life portrayed online; my life is not perfect and it does not need to come across that way. Today I tried to take pictures of Harrison with a new toy he was sent, a new toy which he never asked for and he didn't want to play with - much to my dismay. He'd smile briefly before chewing his hands and ignoring the toy completely, and I kept getting frustrated, wondering how I could force a baby who was more than content to play with his fists to play with a toy we probably didn't need in the first place, even just for a split second, so that I could capture the moment. It only highlighted what I've been thinking for the past few weeks, why do I even bother with this? I'd lost any motivation to simply write what I wanted to anymore, instead becoming fixated on what was coming into my inbox. I'd taken pride in writing posts that were honest, yet continued to produce reviews on items I would never have spent my own money on. I've filled my days with pressure to produce content after content, but for what? £80 for writing a post about maintaining your car tyres is not worth the stress it gives me trying to write the bloody post. Other bloggers can post daily and create content that they are proud of without getting stressed, and I am envious of those individuals, as I am simply not one of them. Trying to write the best blog about my child prevented me from enjoying the time with my child, and I won't let that happen again. Maternity leave is fleeting - whether I choose to return to my previous job or I go in the direction of Social Media Marketing, I'll be losing a lot of time with my child - and at that point I'll wish I'd put the camera down and just enjoyed the giggles for what they were. At this point, continuing my blog isn't worth it. But then I remember the email I had two days ago, thanking me for writing a post about feeling lonely and investing time in the online world, a post that had helped someone else feel less alone. I remembered the tweet from someone telling me how much they loved reading my pregnancy updates, and how it gave them something to relate to. I remembered obsessing over Hayley's bump updates when I myself was pregnant, being able to compare like for like and feel like someone else understood. Blogging helps people - it helps me when I write, it helps others when they read. I cannot fault having a blog, it has given me more opportunities in the short 8 months I've had mine than I could ever have expected, introduced me to some of the loveliest girls, and given me the motivation to strive for what I truly want to do in live. Today was a down day because of the pressure I put on myself to measure up to everyone else, but there is no need for that. I got caught up with numbers, dwelling on my rank and in page views, and forgetting the reasons I started this in the first place. My blog is my own space, to complain about my life and about my child, to gush over my life and my child, to collaborate with the brands I use daily and feel strongly about. Today was only a difficult day because I had lost sight of what I really should have been looking at.